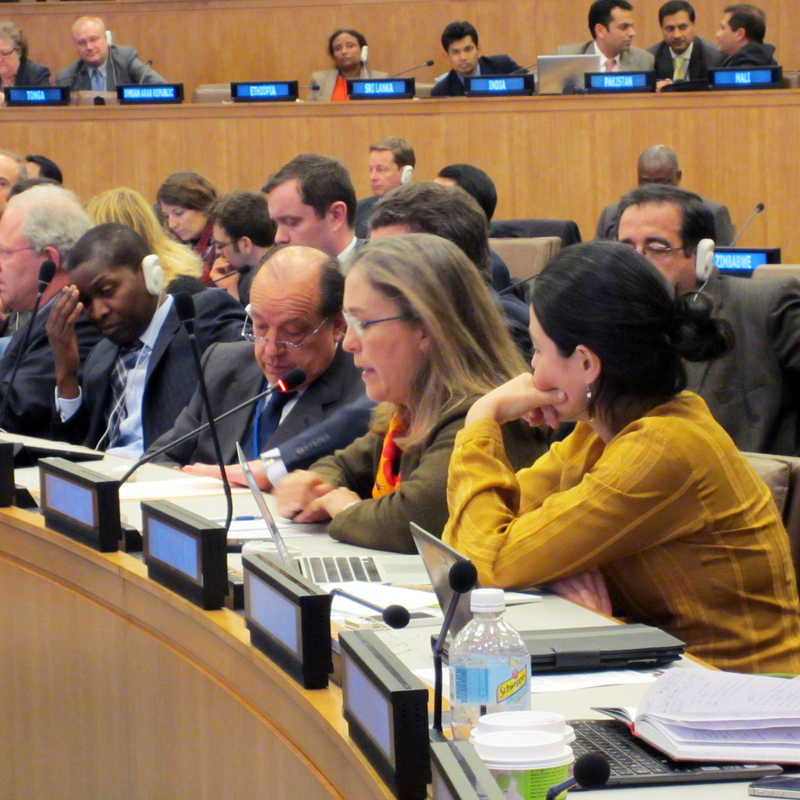 Paula Caballero, Colombia, addresses the OWG for the final time during a discussion of the way forward. On the final day of OWG 10, delegates discussed means of implementation/global partnership for sustainable development during the morning and peaceful and non-violent societies, rule of law and capable institutions during the afternoon. During the morning, some delegates preferred to include targets related to means of implementation under each goal as well as to have a stand-alone goal regarding it, while others preferred to have these issues addressed in a goal only. During the afternoon, some delegates suggested creating two goals, one addressing peaceful societies and the other regarding rule of law and governance. Others argued against including peace and security issues in the SDGs, and said rule of law and governance concepts could be incorporated under appropriate goals. During an evening discussion on the way forward, Co-Chair Kamau noted that the Group had discussed an incredible number of ideas in the last week. He said narrowing them down is not going to be an easy process, but that it is the challenge that the UN Member States set for themselves at Rio+20. He added that it is doable if the Group remains committed to the objective. Kamau presented the Co-Chairs’ proposal for how to proceed during the next three meetings of the OWG, according to which the Co-Chairs would revise the focus areas document based on the discussions at OWG 10 and issue another version on 18 April 2014. He said the time is not yet ripe for negotiating language, as the OWG needs to further refine the goals and targets before discussing the specifics of those goals and targets. He encouraged the Group to not get stuck in 19th and 20th century issues, but to keep 21st century issues such as climate change, cities, and governance high on the agenda. After a number of statements in which delegates expressed both exhaustion and excitement with the week, Kamau closed OWG 10 at 7:25 pm. Download the IISD RS briefing note from this Conference in HTML or PDF format.